fix a bug in IV curve export during TID simulation. fix a bug about boundary inconsistency on AC simulation. Rewritten TID effect solver which solves fully-coupled equations in all regions in the device. Added support for boundary-layer profile, enabling user to specify trap profile near a boundary or interface. Barrier-lowering effect at Schottky boundary is now calculated self-consistently. Genius can be loaded as external simulator by a higher-level simulator, through Cogenda's SimuHub API, based on the Schur-complement method. Optimized speed and reduce memory usage during simulation structure initialization. Export structure in STEP format, compatible with FDTD simulator CEM. Total Ionizing Dose (TID) effect solver enhanced, hydrogen center in oxide supported. Oxygen-Rich Polycrystalline Silicon material (widely used in power devices) supported. Re-meshing sup file (generated by process simulator suprem4) supported. Besides of NETGEN, a new mesh generator CTET added. CTET is more stable in geometry operations. Fixed miscellaneous bugs in mixed-mode transient simulation. 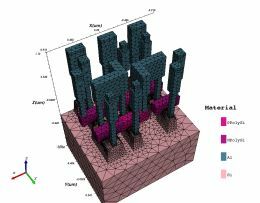 Improved imcomplete ionization model support in SiC materials. Improved convergence of TID solver. Fixed a bug in SiC Masetti mobility model. Fixed numerical round off problem about cylinder mesh generator CY2D and CY3D. Fixed a bug in mixed-mode simulation when "solderpad" boundary is in contact with an insulator material region. Fixed a bug in mixed-mode simulation where two sequential transient simulations suffers from a discontinuity in node voltage. Support export of SPICE device internal state variables along with nodesets, so mixed-mode transient simulation can be restarted from a previously saved state without discontinuity. Improved auto time step control of mixed-mode simulation. New solver for Total-Ionizing Dose (TID) effect. Support simulation of x-ray pulse (dose-rate) effect. Updated material models: diamond, 4H-SiC, GaAsSb, GaP, etc. New VTK data structure to store field values on both sides of an interface in VTK files. Support trap and other customer field definition in TIF files. Added cylindrical mesh generator for modeling devices such as particle detectors. Import several TIF mesh files at a time. Fixed a bug of AC solver. It failed when more than 2 metal regions shares one point. Fixed several bugs in DF-ISE importor. determine data type by function name instead of dataset name. Fixed a bug of n_ie calculation with bandgap narrowing effect. Fixed a bug in driving force of carriers with varying affinity, Nc, Nv, Eg, BGN. A 3D SRAM model with 96,000 nodes. Create the model directly from mask layout and you can simulate circuit cells at stunning speed.